I've never seen theater at the Walker Art Center, in fact I haven't been there since before the Guthrie moved from their original location next door to their current home on the river eight years ago. The Walker's annual Out There series, "a monthlong festival featuring new global performances, workshops, dialogue sessions, salons, and other activities," was recommended to me, so I decided to take in a performance. I also took advantage of the Target free Thursday nights to visit the museum for a few hours before the show. I have to admit, I know very little about art, and even less about modern art. But I do love to stroll through art museums and be surrounded by the creativity of artists, even if some of it I just don't get. But enough about that - on to the show. 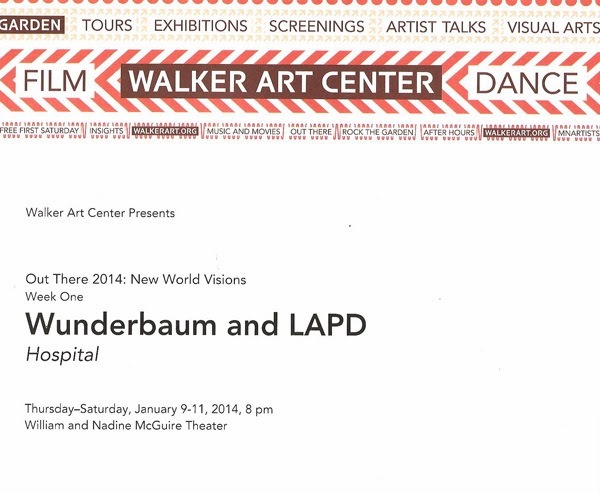 The first of four shows in Out There 2014: New World Visions is a piece called Hospital, a collaboration between L.A. based Los Angeles Poverty Department (LAPD) and Wunderbaum, a theater company from Rotterdam. Hospital explores the ideas of health care, health insurance, and the medical field through the real life of one man - John Malpede (LAPD's Founding Artistic Director). 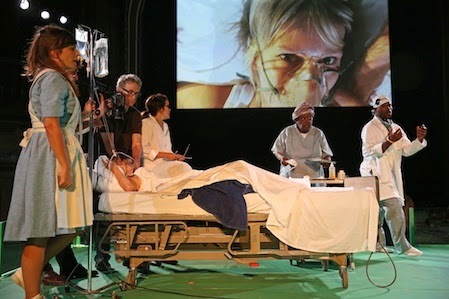 It's not so much a play as it is a series of reenactments of events in his life related to his experiences with health care, interspersed with information about the history of health care in this country (and the Netherlands). Three or four cameras onstage capture the action, which is displayed on a large video screen along with photos and videos. Four actors from each of the two companies play a variety of roles (except for John Malpede, who only plays himself). Hospital and office equipment fill the tables that line the edges of the stage, with actors answering phones, shuffling papers, and searching through binders to represent the endless bureaucracy of the health care system. The show opens with John's birth in 1945 and continues through his time as an artist in NYC in the 60s and his move to L.A. in the 80s, tying events in his life to the development of the health care system. In L.A. he began working with the homeless living in Skid Row (I didn't realize there was an actual place called Skid Row, I thought it was a general term to apply to places that fit the description). John later had emergency surgery while living in the Netherlands, which caused problems with his insurance company upon returning to the U.S. The show concluded with a celebration at the coming of ObamaCare, with a few comments from the audience about their experiences. I enjoyed my first exposure to Out There, although it may be a little too out there for me. It definitely is creative, with great performances by the company and an innovative use of video. It was also very informative and an entertaining way to learn about the history of health care (although at times it felt a little too much like a lecture). If you're interested in some innovative, "out there," global theater, check out this or upcoming shows in the Out There series.